The pieces on display are functional as well as decorative and vary in size, design and color. Custom orders are always welcome. Please contact me with any questions. This unique plate has a gentle curve to it. The background is a milky white transparent glass which highlights the dots dancing upon it. The turquoise striped glass is beautiful. This design is available in any color combination. Another stunning design option is trans-parent black glass with white dots surrounded by opaque red glass. This dish measures 4 inches wide by 7 inches long. 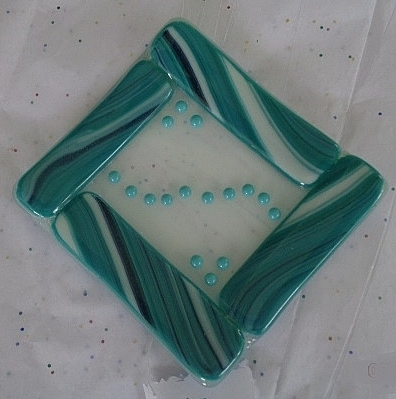 The pattern within the glass is remarkable and the teal fused beads compliment the design. A great dish for sushi, cheese or candy. This beautiful bowl measures 10” long by 4” tall at either end. It has a whimsical dip in the center . The sleek lines contribute accentuate the design. This dish is ideal for sushi. Measuring 7 inches by 3 inches it has a gentle wavy slope to it. The neutral colors in this design will compliment any decor. The specialty cut brown leaves and custom beads accentuate the design .This dish is not recommended for the dishwasher. 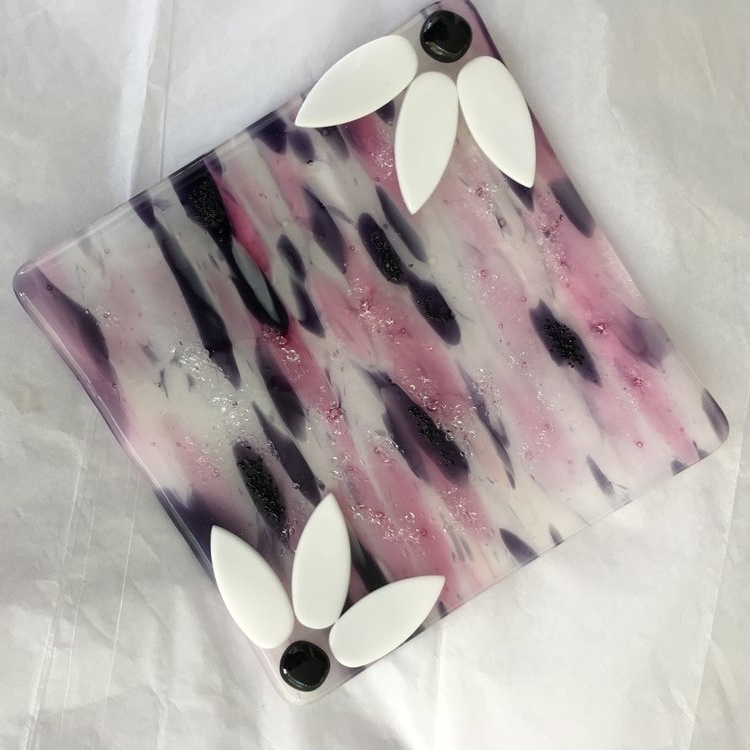 This plate measures 10" x 10" and is ideal as a platter or as a decorative piece. 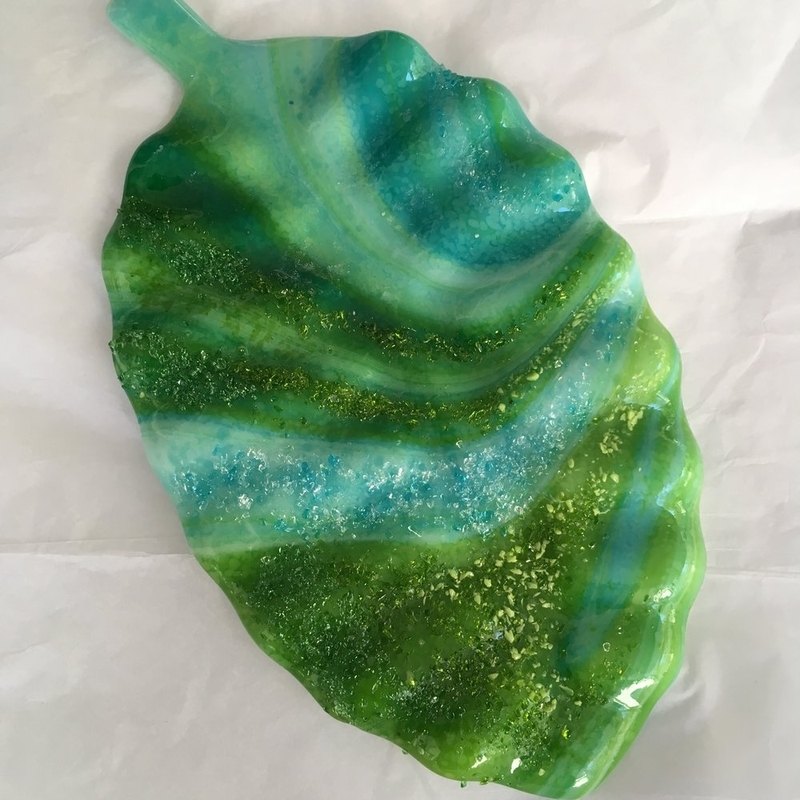 This stunning platter measures 11 inches by 7 inches . The texture is accentuated by the marbled glass that is adorned with complimentary frit that sparkles. This design is two-sided where the top that is displayed is for decorative purposes. The reverse is a complimentary green serves as the functional side. I designed this dish with spring in mind. It measures 6 x 6 inch and has a slight bowl shape. Sprinkled upon the glass are small pieces of clear iridescent glass that resembles droplets of water.